The goal of this study is to determine the global and zonal changes in the tropospheric ozone data product derived from SCIAMACHY limb-nadir-matching (LNM) observations during the period 2003–2011. Tropospheric O3 shows statistically significant increases over some regions of South Asia, the South American continent, Alaska, around Congo in Africa and over some continental outflows. Significant decrease in TOC is observed over some continents and oceans. A. J. Boris, T. Lee, T. Park, J. Choi, S. J. Seo, and J. L. Collett Jr. Samples of fog water collected in the Yellow Sea during summer 2014 represent fog downwind of polluted regions and provide new insight into the fate of regional emissions. Organic and inorganic components reveal contributions from urban, biogenic, marine, and biomass burning emissions, as well as evidence of aqueous organic processing reactions. Many fog components are products of extensive photochemical aging during multiday transport, including oxidation within wet aerosols or fogs. This paper reports on single-particle measurements of ambient aerosol particles and cloud residues sampled from orographic clouds on a mountain site in central Germany. The results show that soot particles can get efficiently activated in cloud droplets when they are mixed with or coated by sulfate and nitrate. Cloud processing leads to addition of nitrate and sulfate to the particles, thereby increasing the hygroscopicity of these particles when they remain in the air after cloud evaporation. Sources of nitrogen deposition (Ndep) in Federal Class I areas in the US are investigated, identifying unique features in contributions from different species, sectors and locations. Ndep in many parks is impacted by emissions several hundred km away; the role of oxidized vs reduced sources varies regionally. Emissions reductions in the western US most effectively reduce the extent of areas in critical load exceedance, while reductions in the east most effectively reduce exceedance magnitudes. By conducting various simulations of dry and moist baroclinic life cycles, we aimed to improve the understanding of whether dynamical or diabatic processes are more relevant to form a tropopause inversion layer at midlatitudes. Most importantly, our experiments highlighted the role of different moisture related processes for the formation and evolution of the tropopause inversion layer with varying relevance and strength in different phases of the baroclinic life cycles. The Beijing-Tianjin-Hebei (BTH) region has suffered from severe haze pollution in recent years. It is important to understand the possible reasons and whether it can be predicted on the seasonal timescale. This studies suggested that the winter haze pollution in BTH can be forecasted or estimated credibly based on the optimized atmospheric circulation indices. Thus it is valuable and significant for the government to take action in dealing with the probably severe haze pollutions in advance. High wintertime ozone levels have been observed in the Uintah Basin, Utah, a sparsely populated rural region with intensive oil and gas operations. The reactive nitrogen budget plays an important role in tropospheric ozone formation, and we find that nighttime chemistry has a large effect on its partitioning. Much of the oxidation of reactive nitrogen during a high-ozone year occurred via heterogeneous uptake onto aerosol at night, keeping NOx at concentrations comparable to a low-ozone year. Chemistry-transport models have predicted a change in secondary organic aerosols (SOA) in the future atmosphere with a large uncertainty. This study measures diacids, major water-soluble surrogates of SOA, on a sub-decadal scale in atmospheric aerosols in eastern Asia. Diacids are observed to increase by 3.9–47.4 % per year. The increases in the water-soluble organic acid fraction could modify the aerosol organic composition and its sensitivity to climate-relevant physical properties. Trans-boundary haze pollution is a major health and environmental concern during south-west and north-east monsoon in the South East Asian regions. The concentration of PM2.5 exceeds the tolerable limits (WHO; USA EPA) during the summer monsoon. The novelty of this study is the source characterization of PM2.5 and source-specific risk assessment during intense haze pollution, which are yet to be addressed in this region. The outcomes of this study will give an insight about future implications. This paper reports the results of a field campaign with ozonesondes held in Manus Island, Papua New Guinea in February 2014. Particular attention is paid to the background current correction for the ozonesondes. 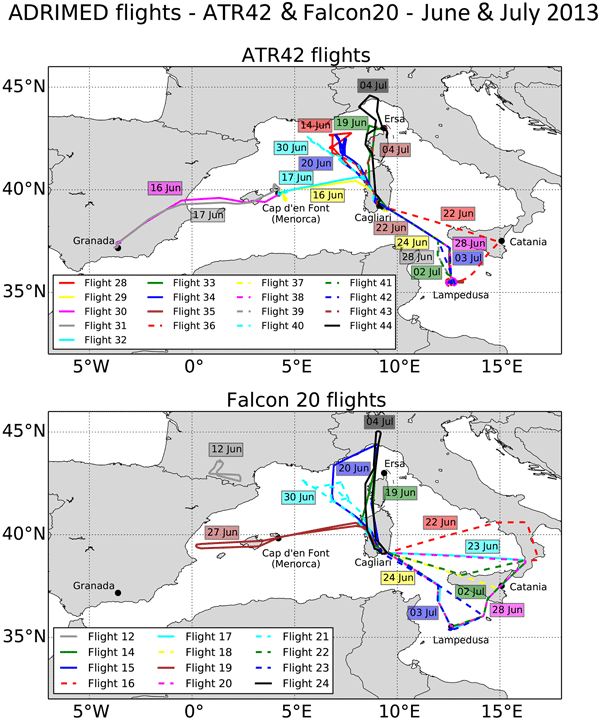 We show that the ozonesonde profiles compare very well with near-coincident aircraft measurements, and show no sign of the extremely low ozone concentrations (< 5 ppbv) reported by previous papers. The minimum repeatable ozone concentration just below the tropopause was 12 ppbv. The ROHP-PAZ mission will collect, for the first time, GPS radio occultations at two polarizations with the aim of characterizing rain. Prior to the mission's launch (2016), a field campaign has been conducted to identify and understand the measurements. In this study we present the set-up and the results of such a campaign: the main finding is the confirmation of sensitivity to heavy rain and, unexpectedly, to other frozen hydrometeors. This is key information for the spaceborne experiment. Large eddy simulations (LESs) are performed for the area of the Caribbean island Barbados to investigate island effects on boundary layer modification, cloud generation and vertical mixing of aerosols. Incoming Saharan dust layers are analyzed and effects of layer thinning, subsidence and turbulent downward transport become apparent, which are sensitive to atmospheric stability and wind shear. Comparisons of LES model output with lidar data systems are made to validate the modeling results. The formation of SOA and sulfate aerosols from the photooxidation of gasoline vehicle exhaust (GVE) when mixing with SO2 was investigated in a smog chamber. We found that the presence of GVE enhanced the conversion of SO2 to sulfate predominantly through reactions with stabilized Criegee intermediates. On the other hand, the elevated particle acidity enhanced the SOA production from GVE. This study indicated that SO2 and GVE could enhance each other in forming secondary aerosols. A large-eddy simulation model is used to show that a weakening of the large-scale subsidence, which is associated with a future warmer climate, leads to a delay of the moment of break up of stratocumulus clouds during subtropical stratocumulus transitions. To understand what causes this delay, a novel analysis method is used to distil the contributions of individual physical processes to the evolution of the stratocumulus cloud thickness. HNCO is a toxic molecule and can cause cardiovascular and cataract problems through protein carbamylation once inhaled. Recently reported ambient measurements of HNCO in North America raise concerns for human exposure. To better understand HNCO's loss processes and behaviour in the atmosphere, we provide thermochemical data on HNCO. The parameters allow for more accurate predictions of its lifetime in the atmosphere and consequently help define exposure of this toxic molecule. Based on extensive aircraft campaigns, we quantify how biomass burning smoke affects subarctic and Arctic liquid cloud microphysical properties. Enhanced cloud albedo may decrease short-wave radiative flux by between 2 and 4 Wm2 or more in some subarctic conditions. Smoke halved average cloud droplet diameter. In one case study, it also appeared to limit droplet formation. Numerous Arctic background Aitken particles can also interact with combustion particles, perhaps affecting their properties. A multi-model approach consisting of a bottom-up ship emissions model and a chemistry transport model was used to evaluate the impact of shipping on air quality in North Sea bordering countries. As an example, the results of the simulations indicated that the relative contribution of ships to NO2 concentration levels ashore close to the sea can reach up to 25 % in summer and 15 % in winter. Some hundred kilometers away from the sea, the contribution was about 6 % in summer and 4 % in winter. Scenarios for future shipping emissions in the North Sea were developed. Compared to today, the contribution of shipping to the nitrogen dioxide and ozone concentrations will increase due to the expected enhanced traffic by more than 20 % and 5 %, respectively, by 2030 if no regulation for further emission reductions is implemented. PM2.5 will decrease slightly because the sulfur content in ship fuels will be reduced. This study provides a first step to understand the impact of vehicular emissions on the formation of secondary particles as well as the feedback between these particles and meteorology in the Sao Paulo Metropolitan Area (SPMA). Among the main research findings are: - The emissions of primary gases from vehicles led to a production between 20 and 30 % due to new particles formation in relation to the total mass concentration PM2.5 in the downtown SPMA. We present microphysical observations of cumulus clouds measured over south-west England during COPE in summer 2013. Detailed sampling focused on an isolated liquid cloud that glaciated as it matured to merge with a band of cloud downwind. The first ice particles observed were frozen drizzle, while columnar ice dominated in the mature stages. We discuss the interactions between the warm rain and secondary ice processes, and their importance for the formation of precipitation. We found that the near-surface lapse rate has significantly decreased with a trend of −0.18 ± 0.03 °C (10 m)−1 per decade. We also showed that the 9 m height temperatures increased faster than temperatures at the 1.5 m screen level and/or conditions at the 1.5 m height cooled faster than at the 9 m height. The impact of atmospheric mineral aerosol deposition on the albedo of snow & sea ice: are snow and sea ice optical properties more important than mineral aerosol optical properties? The decrease in reflectivity (albedo) of sea ice and snow containing mineral dusts and volcanic ashes is calculated. The type of snow and sea ice, the thickness and the layering of mineral aerosol deposits are varied. The results show that the response of the albedo of snow and sea ice to mineral aerosol deposits is more sensitive to the type of snow or sea ice than to the properties of the mineral aerosol deposits themselves. This work deals with the origin and nature of atmospheric ice-nucleating particles (INPs). An accurate determination of the atmospheric INP concentration is relevant since INPs induce freezing in clouds, thus initiating an efficient mechanism for cloud particles to reach a precipitating size. The effect of relative humidity on the INP concentration at ground level was analyzed and discussed. A 2-year data set is analyzed to evaluate the consistency and limitations of current ground-based and satellite-retrieved cloud property data sets. We demonstrate that neither the assumption of a completely adiabatic cloud nor the assumption of a constant sub-adiabatic factor is fulfilled. As cloud adiabaticity is required to estimate the cloud droplet number concentration, but is not available from passive satellite observations, we need an independent method to estimate the adiabatic factor. Chemical characterization of fine aerosol was conducted due to air pollution by fine particles in the last decade. The diagnostic ratios and CMB receptor model based on organic markers showed that gasoline- and diesel-powered vehicles are the main emission sources (CMB = 64 %) of this class of organic compounds in PM2.5. Other pyrogenic sources as contributors to fine aerosols. Fine particles are related to human health impacts. In addition, these results can be useful for policy making. The remote Southern Ocean is known to be one of the most pristine environments on the planet, but we found that cloud droplet and aerosol concentrations during one research flight in June 2009 were higher than expected. We were unable to attribute this to continental aerosol sources, and we hypothesize that strong winds resulted in local aerosol production in the form of sea salt. This has several consequences for climate modelling and cloud physics research. An ensemble optimal interpolation (EnOI) data assimilation technique is used to investigate the possibility of optimally recovering the spatially resolved emissions bias of BC. The inversed emission over China in January is 240.1 Gg, and annual emission is about 2539 Gg. Even though only monthly mean BC measurements are employed to inverse the emissions, the accuracy of the daily model simulation improves. We finds that EnOI is a useful and computation-free method to make top-down estimation. Airborne measurements in Baltimore-Washington, DC allow for an understanding of the relationship between aerosol extinction which can be measured by satellites and aerosol mass used for air quality monitoring. Extinction was found to be driven to first order by aerosol loadings; however, humidity-driven aerosol hydration plays an important secondary role. Spatial and diurnal variability in aerosol composition were small, but day-to-day variability in aerosol hygroscopicity must be accounted for. This manuscript introduces a conceptual design of a global, hierarchical observation network which provides tools and increased understanding to tackle the inter-connected environmental and societal challenges that we will face in the coming decades. Each ecosystem type on the globe has its own characteristic features that need to be taken into consideration. The hierarchical network is able to tackle problems related to large spatial scales, heterogeneity of ecosystems and their complexity. The paper focuses on the determination and interpretation of historic records of organic compounds in an ice core from Grenzgletscher in the southern Swiss Alps, covering the time period from 1942 to 1993. The resulting long-term records of organic species were found to be influenced by the forest fire history in southern Switzerland, anthropogenic emissions, as well as changing mineral dust transport to the drilling site. The paper presents aerosol properties measured during the Cloud Aerosol Radiative Forcing Experiment (CARDEX) on the Maldives Islands in winter 2012. The vertical distribution of absorbing aerosol which is very relevant to the radiative forcing in that region, is investigated. A method for determining particle absorption and equivalent black carbon concentration from lidar extinction coefficients, characteristic single scattering albedo and mass absorption efficiency, is presented and evaluated. When comparing models against observations, researchers often use long-term averages without due regard for the temporal sampling of the underlying data sets. We study the errors introduced by this practice and show they are often larger than observational errors and comparable to model errors. We further analyse what causes these errors and suggest best practices for eliminating them. This study investigated the cloud droplet activation behavior and hygroscopic growth of mixed anthropogenic and biogenic SOA (ABSOA) compared to pure biogenic SOA (BSOA) and pure anthropogenic SOA (ASOA). Cloud droplet activation behaviors of different types of SOA were similar. In contrast, the hygroscopicity of ASOA was higher than BSOA and ABSOA. ASOA components enhanced the hygroscopicity of the ABSOA. Yet this enhancement cannot be described by a linear mixing of pure SOA systems. Most pre-existing measurements lack a linkage between particle hygroscopicity and chemical composition with a high time resolution in China. Our work provided a general overview of particle hygroscopicity and its closure with chemical composition on the basis of HTDMA and AMS measurements. An increase in particle hygroscopicity with increasing air pollution level was found, as well as a quick transformation from external mixtures to internal mixtures for pre-existing particles during NPF events. We investigate the spatial distribution of submicron aerosol in the greater London area as part of the Clean Air for London (ClearfLo) project in winter 2012. Although the concentrations of organic aerosol (OA) are similar between a rural and an urban site, the OA sources are different. We also examine the volatility of submicron aerosol at the rural site and find that the non-volatile organics have similar sources or have undergone similar chemical processing as refractory black carbon. Using a novel instrument, we have made measurements of organic compounds that can exist as a gas or particle in the rural atmosphere. Through hourly measurements, we have identified the sources and atmospheric processes of these compounds, which are important for modeling the climate and health impact of these emissions.